Saratoga PLAN hosted 606 hungry and thirsty patrons of local food at the 13th annual Feast of the Fields on September 20, held at Saratoga National Golf Club in Saratoga Springs. The event paired ten chefs from area restaurants with farm-fresh ingredients, local beverages, and other regional foods supplied by more than 65 local farms and vendors. Each chef provided delicious small plates at individual tasting stations. DeCrescente Distributing provided a wealth of beer, wine, and distilled spirits to wash it all down. In addition to enjoying the beautiful ambiance at Saratoga National, the crowd enjoyed the sounds of Hot Club of Saratoga. 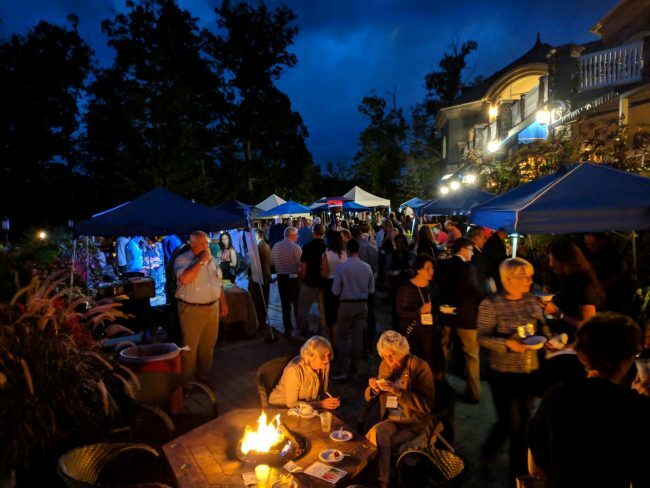 A silent auction provided the chance to win a wide variety of local products and experiences, including a plane ride, a boat ride, a paddling adventure, ski trips, golf outings, artwork, outdoor gear, delicious wines and spirits, and much more. And, tickets were sold to win a Borealis carbon fiber fat bike, for those that felt they needed to burn off a few calories after the filling evening. The bike raffle will continue until December and tickets may be purchased at PLAN’s office. Michelle Hall, Saratoga PLAN Event Coordinator, said, “Feast was a tremendous success, and we sold out, as usual!” She added, “It was great to see so many supporters of local farms come out to enjoy a wonderful evening while also providing support for Saratoga PLAN’s work protecting farmland and natural habitats.” Hall said PLAN raised about $75,000 at the event. “I’d like to extend a special thanks to the many volunteers that helped organize the event, and picked up and delivered the ingredients to the chefs,” said Hall. In 2018, Saratoga PLAN will conserve more than 1,300 acres of productive farmland in Saratoga County. Mike Horn, Saratoga PLAN’s Conservation Director, said, “It sounds like a lot of land until you learn that there are 90,000 acres of agricultural land in the county, and only 4% of it is protected from being developed.” He noted that Saratoga County’s population has increased by about 35,000 in the last 20 years.